November and December news from the center.. Since my last blog a lot has happened. As I have been very busy the blog has not been updated as much as I would have liked. Here is the story of the last months GoPro Training in Maroma. It all started with the end of Kelsey, Irene’s and Zach’s Divemaster Resort Specialty. We finished up the program with a great 2 tank dive in Chaac Mol Cenote. 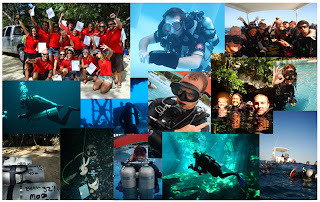 For most of them this was their first Cenote dive and changed a lot about their ideas of cavern diving. Some I am sure we will see back for a cave diving course one day. In the beginning of November we started the IDC with a full class of 13 candidates. Students came from Sweden, Mexico, Austria, Spain, Canada, Bahamas, England, France and the United States. As a special guest in this course we had Simon Page return to audit this IDC and gain experience towards his Mater Instructor rating with PADI. Simon completed the IDC with me same time last year and has since then been working very successfully in Australia as a dive instructor. The IDC was great and filled with many good moments. The top stories was the fun and creativity in the presentations we saw, the Intro to TEC/CAVE and as a special surprise we has a visit form Poseidon Rebreathers who took everybody for a tryout in the pool. 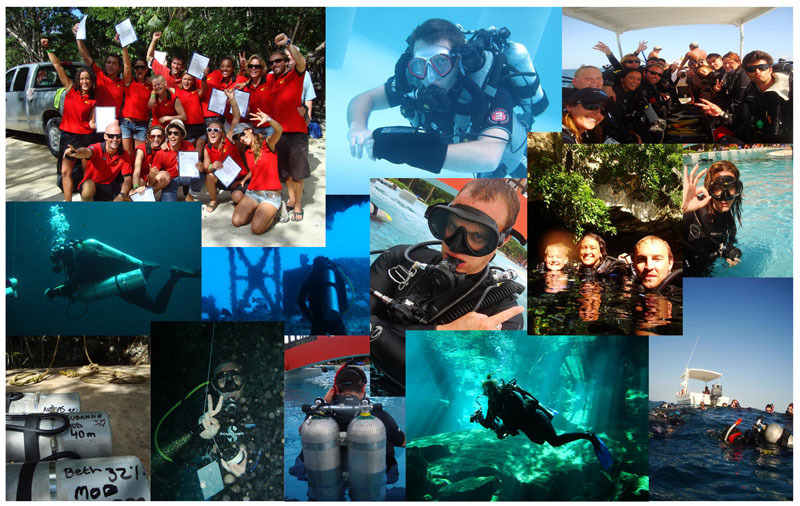 All IDC candidates passed their exams in the beginning of December with flying colors and Cenote Ponderosa under the Examiners Gary and Gale form PADI. Tears of joy and smiles all round J Good job. After a day off from the celebrations, many of the candidates who wised to further their education continued with us in the popular MSDT course. 4 days of great training included Deep Diving procedures and Punta Maroma, Equipment Specially with Scuba Pro Technician, Search and Recovery where we managed to find Anders’s +1000$ dive computer and the captain cell phone (well the next day!!). The final day we went to the Canon boat wreck in Puerto Morelos were we completed both the Wreck and Nitrox Instructor course. A great way to finish up the training. Susanne form Austria and Beth from England return last Monday to the center to learn how to become technical divers. We did 3 days of technical diver training and both became PADI TEC 40 certified at the Cenote “The Pit” which is located inside the Dos Ojos cenote system. The course was fun and both Beth and Susanne showed that they have what it takes to become a tec diver. I hope to see you both back for TEC 45 and 50 some day. Now there is only a few days left before Christmas and most of the students of the November IDC are already working in the area. It’s such a nice feeling to be able to not only teach people how to become diving instructors, but also help them get that first job in the industry.